It’s been three years since the tax cuts in Kansas took effect; tax cuts said by Governor Brownback to be a “shot in the arm” for the Kansas economy. Opponents of the governor and the tax cuts take great delight in reporting the generally anemic growth of the Kansas economy since then. Month after month, the tax cuts are condemned by Kansas newspaper editorial writers and the governor’s detractors. Many people remember that President Barack Obama promised that the unemployment rate would not top eight percent if the stimulus was passed. 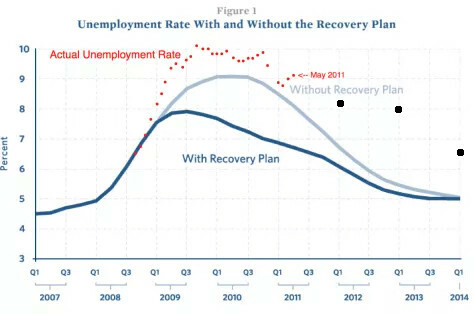 In January 2009 two Obama administration officials, including Christina Romer (who would become chair of the Council of Economic Advisers) wrote a paper estimating what the national unemployment rate would be with, and without, the American Recovery and Reinvestment Plan, commonly known as the stimulus. That plan passed. The purpose of this is not to defend Brownback by showing how Obama is even worse. (Disclosure: Although I am a Republican, I didn’t vote for Brownback for governor.) Instead, we ought to take away two lessons: First, let’s learn to place an appropriately low value on the promises and boasts made by politicians. Then, let’s recognize the weak power government has to manage the economy for positive effect. Indeed, the lesson of the Obama stimulus is that it made the unemployment rate worse than if there had been no stimulus — at least according to the administration projections.